In this article, I introduce the themes and the astrology of the Millennial generation, as part of a new series of readings that I’m now creating. The first crop of Millennials is now just past their Saturn return, making their way in a world that does not seem to support their idealism. I have released the first segment in the Generation: Millennials reading! You can order the full reading here; segments are being published individually. Note: I have released the first segment in the Generation: Millennials reading! You can order the full reading here; segments are being published individually. Sometime in the early 1980s, people started displaying the ‘Baby on Board’ sign in the back windows of their cars. Far from being the Pet Rock of its day, this sign heralded new attitudes in parenting, and the arrival of a new generation — the Millennials. 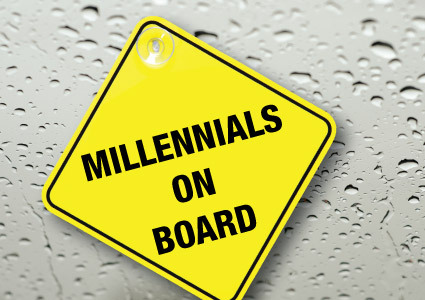 Millennials on board. Illustration by Lizanne Webb. These kids were welcomed to the world, and grew up amongst parents who really did their best for them. The cynical attitudes toward parenting of the 1960s and the 1970s were finally being left behind. Now, the first arrivals from this generation are at or just beyond their first Saturn return, the astrological gateway into adulthood. Yet they face a world that seems openly hostile to their growth and progress. For one thing, most of the Millennials who went to college carry a ridiculous amount of student loan debt. And there is a question whether their education even prepared them for life in the 21st century — and if not, how they are going to get that preparation. Second, they are emerging into an economy where there are not many job opportunities for them. Said more precisely, the concept of a job is changing; some would say it’s evaporating. Millennials are coming of age in a world that is unrecognizable from anything their parents experienced. Many are struggling to find their way. Many have high ideals that they want to express — but don’t know how or where. They care about the issues they see most other people avoiding, but it’s difficult to find a way to connect. And it doesn’t build any confidence if they live with their parents at age 23 or 27 or 32. Nobody I know has a clear idea what to do about this. But I think that astrology can help shed light on this generation. And I’ve been preparing a reading for you and your family that will do just that. In this special reading, I will speak directly to millennials and their families about the basics and the details of the time in which they were born — as told by astrology. This astrology tells the story of a world in constant flux; a world with no solid ground to stand on. A world of conflicting expectations and images. A world where there seems to be no hope, but where being hopeless is not an option. 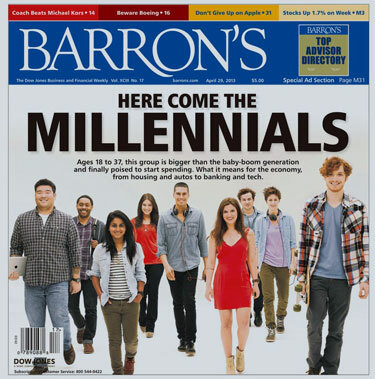 Barrons, welcoming the Millennials as the next generation of consumers. These are the ‘digital natives’ — who are not a crop of Mark Zuckerbergs. Actual innovation is a special talent. I am aware this reading may appeal more to parents than to young people themselves. I encourage you to get it, listen, and share it with them. Everyone will benefit. I will cover the astrology for those born across the two decades of Millennial births — from 1985-1995 (young adults approaching or at Saturn return) and from 1996-2005 (kids and teens who are making their way toward adulthood). Then I will add a special section on the very youngest of this generation, which will apply to everyone because we’ve all lived through the same astrology. For those with some knowledge in the subject, I’ll cover Pluto through Scorpio and Sagittarius; Uranus through Sagittarius, Capricorn and Aquarius; Chiron through the most challenging phase of its orbit; and Earth-shaking aspects such as the Saturn-Uranus-Neptune conjunction, the Chiron-Pluto conjunction, and others. I will give examples of major historical events and how they impacted the lives of young people — including the fall of the USSR and 9/11. I will make these descriptions clear and easy to understand and apply. That is my specialty — astrology you can put to work and use to help you solve problems and think through questions. – What are the issues with leadership in the digital age? 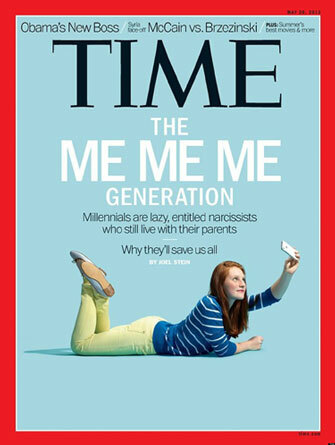 Yet another Me Generation — Time can’t seem to get away from this theme. Is this really an accurate description of the Millennials ? It seems to be a bit narrow. – What has happened to the concept of an ‘adult’? – What’s the story with relationships and sexuality? – What special contribution will the Millenninals make? I consider this reading a family purchase. It’s designed for everyone — people born between about 1981 and 2005 as well as their parents and others who care about them. Therefore, you may share this report with everyone in your family. It will help you see what you’ve been missing, spot important growth themes, and propose strategies to get everyone on the same page. This is the first report in a new series of generational readings. It will be available around May 1. You may pre-order now for the get-in-early price of $39.95 (full price will be $49.95). It will be approximately two hours of audio, clearly organized by topic, with a written introduction, as well as instructions and tips for making the most of the reading. Most sections will be suitable for teenagers; one will handle adult topics. I will also include charts with clear instructions. And best of all, we will have a special Talk To Me session, a teleconference for everyone who is ‘on board’ with this exciting reading. I am very excited about this reading. I’ve been researching and developing it for months — and I know it will not just be helpful to you. You will love it, and benefit from it, and feel vindicated by it. You will listen many times, getting something new every time you do. THANK YOU for creating this Eric!! As a millenial I know lots of us need to hear what you have to say on this. So much is shifting and a map of the playing field helps tremendously. Parents and grandparents of the emerging Millennials — and earlier members as well — thank you for this critical information, Eric. If the world is confusing to those of us who’ve been around awhile, think how chaotic it is for those we’ve ushered in! A great idea and a much needed compass to help push aside the brambles on the path! My son was born October 25th 1993, with Uranus and Neptune in exact conjunction at 18:34 Capricorn. He has Sun Mars Mercury and Pluto all in Scorpio. Loves have been Dinosaurs, Monsters, and apocalyptic video games. He seems comfortable and at ease with the horrors of the inner mind and able to play on the edge of reality without getting lost or confused. I could have never immersed myself in such horror without it affecting me. This generation seems ready able and willing to take on the shadow side of life. Some of his qualities are he’s easy going but doesn’t share more than necessary. He chooses his friends carefully and is extremely loyal. He manages his affairs responsibly but has little ambition beyond the near term concerns. He craves simplicity and doesn’t concern himself with drama beyond his sphere of experience. All of his pears are as is he – just really good kids. I feel like we are in pretty good and wise hands over the next generational power transfer. This project is so exciting Eric; thank you for creating it. Helping them to engage their sense-perceptions using their bodies organs of sense, sans technological device of choice, stirs a deep awkwardness in their sense of self. With persistence though, they grow to love the “first hand” connection. Parenting a Millenial hasgiven me the gift of rewriting my childhood experience, and changing the parent-child dynamic in my family. I am excited to hear the recording, and contemplate (more) how to support my child toward success and joy in life.